This was a very redemptive week of cooking. Many salads and vegetable soups to recover from the holidays. All healthful things, but nothing that feels like punishment or tastes like cardboard (and there was still pizza). Buffalo cauliflower pizza. I had a vague pizza plan for dinner, and while grocery shopping Will requested buffalo cauliflower (like this salad). For the sauce I used a standard 1:1 butter:hot sauce mix (which was way too runny, but I’ll work on it). I roasted the cauliflower first then tossed it in the same hot sauce mixture. Some chopped kale, red onion, bleu cheese crumbles, and sliced mozzarella also went on top. Great flavor, thin sauce, more pizza to be made. I made this salad again to go alongside. Carrot ginger soup (from Flour, Too). Why do I keep trying to make root vegetable puree soups? The description of this was so convincing, yet I think without the power of an industrial blender there is no hope of a carrot or sweet potato soup ever being a texture I like. My only idea for a solution so far is to add coconut milk to every recipe as in this soup. Kale + Brussels sprouts caesar slaw with pine nut parm. I bought some of the ingredients to make this salad last winter and somehow just got around to it. I can’t say that the pine nut mixture truly tasted like parm, but I can say that it was a nutty, buttery, lemony salad topping that I would like to make again and again. 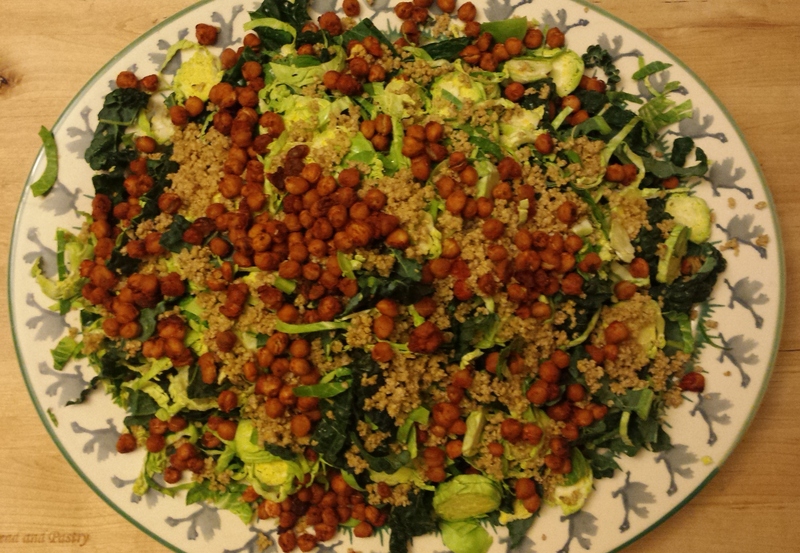 The crunchy chickpeas were a nice contrast to the dressing and greens. Lentil soup. Winter is actually happening in MA. There was snow and ice on the ground and the day I made this it was below 10F. 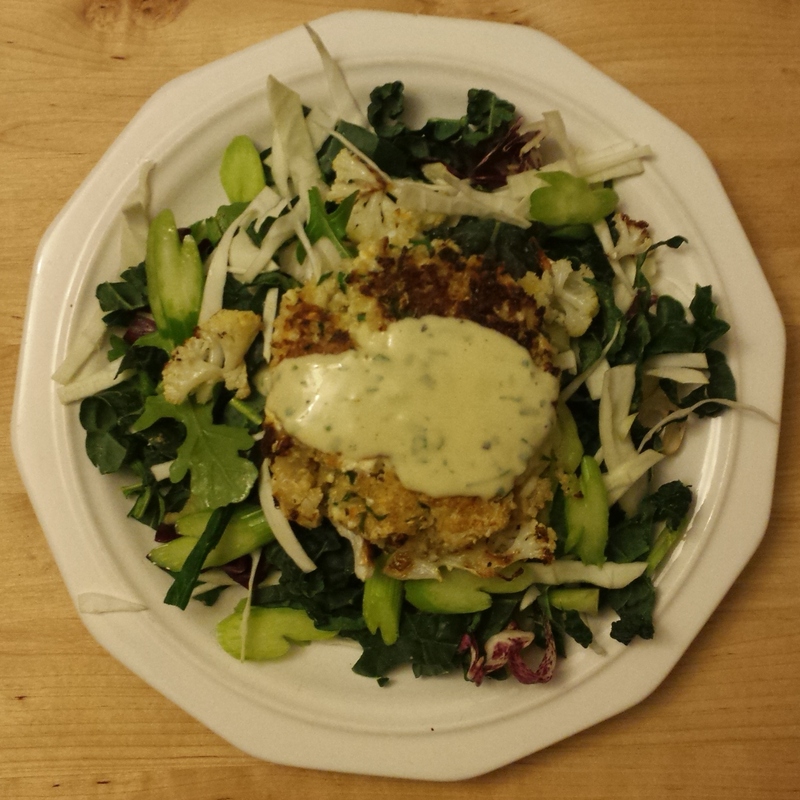 I had the cauliflower patties below planned for dinner, but something light and a salad just would not cut it. I had an onion and celery on hand, no carrots, but a few red potatoes went in. A tablespoon of tomato paste was added along with the smoked paprika for some additional tomato depth. Good, crusty bread alongside is key. Quinoa Cauliflower Patties. I always get cooking amnesia after making this. It seems easy enough to throw together (mix ingredients together in a bowl! ), but after the mixture rests then comes the frying of the patties, which don’t stay together easily despite the 4 eggs included. They are better to make small and thinner, because big thick patties crack when you try to flip them. The whole frying process easily takes more than 30 minutes. After all this then you sit down and have them with a salad and dressing (that you made while the mixture was resting) and you have these surprisingly light patties with lemon, herbs, and a nuanced saltiness from the feta and they are SO GOOD. So you delight in their deliciousness and happily eat the leftovers and then a time goes by and you start craving them and the whole process starts over. French onion soup (recipe forthcoming!) with kale salad with dried cherries and pecans and blue cheese gougères (both recipes from The Smitten Kitchen Cookbook). The kale salad has a great Dijon dressing with can accompany just about anything. The gourgères have a lot of butter and eggs…but they are surprisingly easy and quite impressive. Plus with so much flavor in a tiny, airy puff! Delightful in so many ways. 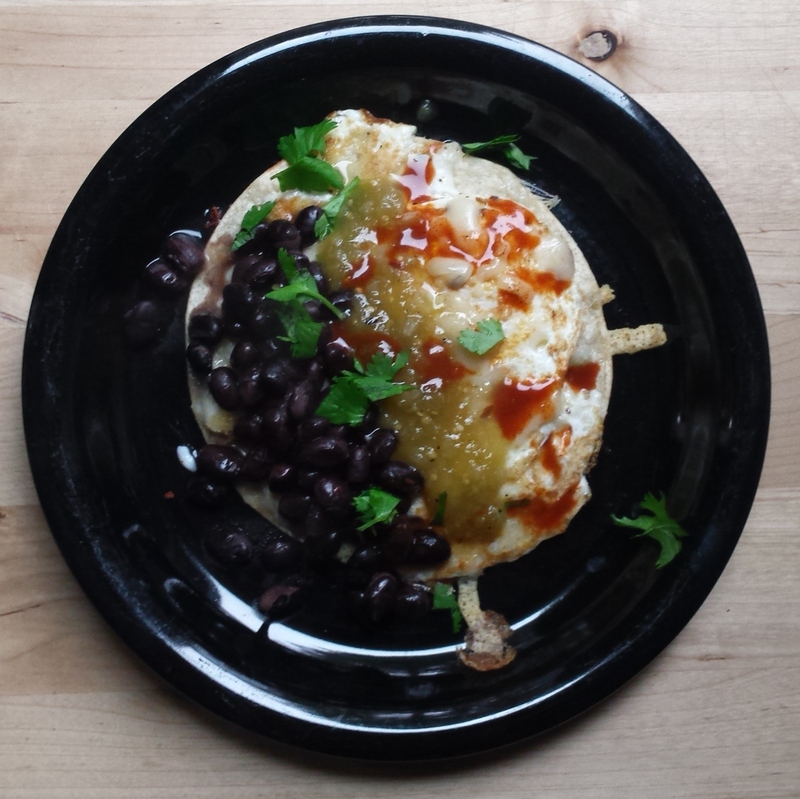 Huevos rancheros (pictured at top). I love this method for cooking eggs and tortillas. The tortilla gets nice and crisp and the egg fuses to it with a little cheese. Top with whatever pleases you, but salsa, beans, and cilantro are very nice (I would have thrown on some avocado too if it was around).